Are you using the same Bluetooth keyboard across more than one device and getting tired of having to un-pair and re-pair it with each device every time you need to swap platforms? Well Logitech now has the answer! 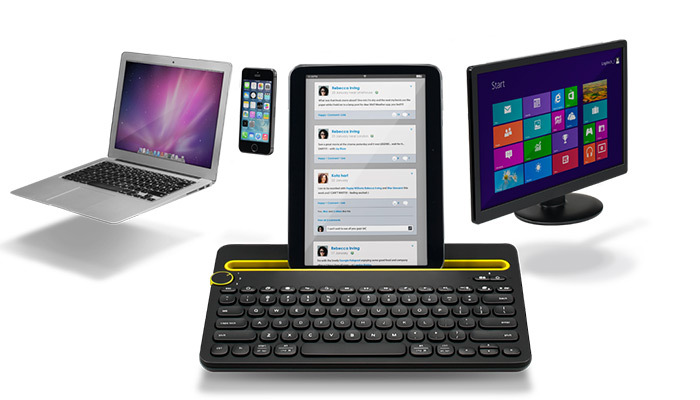 The Logitech Bluetooth Multi-Device Keyboard K480 is designed to be used with up to three devices, regardless of computing platform, at the same time. Now, you can work on your Windows, Mac or Chrome OS based computer, switch the Easy-Switch dial, and instantly be able to respond to a message on your smartphone or tablet. The full size keyboard measures 20 mm (0.79 inches) x 299 mm (11.77 inches) x 195 mm (7.68 inches) and weigh just 820 g (1.81 pounds). Offering you a full keyboard experience in a small portable package. For tablet and phone users there is also a docking cradle which can be used to hold your phone or tablet at a comfortable angle. For you fashionista geeks out there the Logitech Bluetooth Multi-Device Keyboard K480 comes in two colors, black with yellow highlights and white with grey highlights. Logitech has priced the K480 Bluetooth keyboard at $49.99 which considering it an replace multiple keyboards at once seems pretty reasonable. The keyboard is expected to be made available in both US and Europe markets later this month September. iOS 8 Is Here Is Your iPhone Ready?